The customary method of evaluating the pulse of the American people, which gives us an idea of what they are thinking and where they stand on issues, is usually through surveys, opinion polls, and of course how they vote. However, although on a smaller scale, there is another medium that can afford us consumers of news and information a glimpse of what people are thinking. With this in mind, I’ve perused a number of the print and online media and have gathered together some “Letters to the Editor.” Some are comical, others are serious, and some are downright insulting toward some unsuspecting nemesis, usually the president. So here are the letters, word for word, without any spelling or grammatical changes. In certain cases it was necessary to shorten, show only a few sentences of the content of a letter, but the main theme or sentiments of the writer are intact. Here are a few; I’ve taken the liberty to add my own opinion in (parenthesis) at the end. “Classrooms are filled with ubiquitous gray metal cabinets, and only the teacher has the key. Instead of pistols, why not stock these cabinets with smoke grenades and/or tear gas canisters”? (And how about stink bombs and percussion and flash grenades). “Please tell Melania Trump that she will never lose her husband from a heart attack because he has no heart. I don’t even know the Florida victims but I cry and pray every day for their families. I pray and cry for you (the First Lady) and your son to”. (At least it ended well). “It was the best of times. Now it is the worst of times. Really I miss President Obama.” (Good riddance). “The only thing the President would have done had he been at the scene in Florida was poop his pants.” (This letter stinks). “Little Donnie Hitler will do nothing to stop Russia from interfering with the 2018 elections. It’s up to each American to put pressure on Congress and get this wannabe dictator out of the Oval Office”. (The Nazi’s are on the march again). “Seeing photos of Hop Hicks reminds me of a verse from a 1930’s song by Walter Donaldson - “Who wouldn’t believe those lips, who wouldn’t believe those eyes, the night that she told those little white lies”. (They don’t write em’ like they use to). “To all of you who are encouraging parents to keep their children out of school until Congress acts regarding gun control. You are proving to the world that you are using these kids as political pawns to further your anti-gun agenda.” (Agreed). “These young shooting survivors are being exploited by liberals and the media. Many in the public are trying to destroy the NRA, which had nothing to do with the Florida shooting.” (Makes sense). “Right-wing media are attempting to portray the Parkland kids’ efforts to lessen gun violence, avert murder, and approve school safety as a fool’s errand. They couldn’t be further from the truth.” (You can decide, but I think the right wing is ‘right’). “Action speaks louder than words. To serve as a role model for pistol-packing school teachers, President Trump should bear arms to assist the Secret Service.” (I’m for that). “Movie stars are calling for better gun control and blaming the president. Yet they make violent movies and collect gigantic paychecks. They can’t have both ways.” (Why not stop going to their movies). “Our Constitution was based on the concept, “Of the people, by the people, for the people.” Well today the people demand guns to be outlawed - except for law enforcement and military members.” (The thoughts of a totalitarian). “Our alleged president calls for opening up new mental health hospitals as a solution to our nation’s gun problems. Okay, if that’s what he wants, I then suggest he be the first patient committed.” (As long as there’s a computer so he can tweet). “Donald Trump: Deceitful, demented, destructive, domineering, dumb, divisive, denier, draft dodger, dangerous.” (And don’t forget, Deplorable). “This month on 'The View,' host Joy Behar brayed that Vice President Mike Pence was mentally ill because he believed Jesus speaks to him. Last week Oprah Winfrey said if she were meant to run for president, God would have told her. If you’re waiting for Behar to say Oprah is mentally ill, don’t hold your breath.” (The “View” - manure for the mind). “You have to admit, since the presidential election, the reporting and daily dose of yellow journalism by most of the mainstream liberal media has included numerous factual errors and outright fabrications.” (Well said). 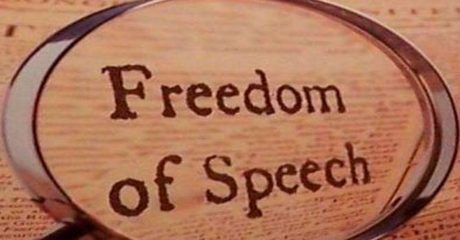 Freedom of speech in America, how lucky we are to be part of a great nation that can speak its mind, without fear of governmental reprisal or persecution.